The first significant investigation into the genomics of Aboriginal Australians has uncovered several major findings about early human populations. These include evidence of a single “Out of Africa” migration event, and of a previously unidentified, “ghost-like” population spread which provided a basis for the modern Aboriginal cultural landscape. The first major genomic study of Aboriginal Australians ever undertaken has confirmed that all present-day non-African populations are descended from the same single wave of migrants, who left Africa around 72,000 years ago. Researchers sequenced the complete genetic information of 83 Aboriginal Australians, as well as 25 Papuans from New Guinea, to produce a host of significant new findings about the origins of modern human populations. Their work is published alongside several other related papers in the journal Nature. The study, by an international team of academics, was carried out in close collaboration with elders and leaders from various Aboriginal Australian communities – some of whom are co-authors on the paper – as well as with various other organisations representing the participating groups. Compelling evidence that Aboriginal Australians are descended directly from the first people to inhabit Australia – which is still the subject of periodic political dispute. Evidence of an uncharacterised – and perhaps unknown – early human species which interbred with anatomically modern humans as they migrated through Asia. Evidence that a mysterious dispersal from the northeastern part of Australia roughly 4,000 years ago contributed to the cultural links between Aboriginal groups today. These internal migrants defined the way in which people spoke and thought, but then disappeared from most of the continent, in a manner which the researchers describe as “ghost-like”. The study’s senior authors are from the University of Cambridge, the Wellcome Trust Sanger Institute, the Universities of Copenhagen, Bern and Griffith University Australia. Within Cambridge, members of the Leverhulme Centre for Evolutionary Studies also contributed to the research, in particular by helping to place the genetic data which the team gathered in the field within the context of wider evidence about early human population and migration patterns. Anatomically modern humans are known to have left Africa approximately 72,000 years ago, eventually spreading across Asia and Europe. Outside Africa, Australia has one of the longest histories of continuous human occupation, dating back about 50,000 years. Some researchers believe that this deep history indicates that Papuans and Australians stemmed from an earlier migration than the ancestors of Eurasian peoples; others that they split from Eurasian progenitors within Africa itself, and left the continent in a separate wave. Until the present study, however, the only genetic evidence for Aboriginal Australians, which is needed to investigate these theories, came from one tuft of hair (taken from a long-since deceased individual), and two unidentified cell lines. The new research dramatically improves that picture. Working closely with community elders, representative organisations and the ethical board of Griffith University, Willerslev and colleagues obtained permission to sequence dozens of Aboriginal Australian genomes, using DNA extracted from saliva. This was compared with existing genetic information about other populations. The researchers modelled the likely genetic impact of different human dispersals from Africa and towards Australia, looking for patterns that best matched the data they had acquired. Dr Marta Mirazon Lahr and Professor Robert Foley, both from the Leverhulme Centre, assisted in particular by analysing the likely correspondences between this newly-acquired genetic evidence and a wider framework of existing archaeological and anthropological evidence about early human population movements. The Papuan and Australian ancestors did, however, diverge early from the rest, around 58,000 years ago. By comparison, European and Asian ancestral groups only become distinct in the genetic record around 42,000 years ago. The study then traces the Papuan and Australian groups’ progress. Around 50,000 years ago they reached “Sahul” – a prehistoric supercontinent that originally united New Guinea, Australia and Tasmania, until these regions were separated by rising sea levels approximately 10,000 years ago. The researchers charted several further “divergences” in which various parts of the population broke off and became genetically isolated from others. Interestingly, Papuans and Aboriginal Australians appear to have diverged about 37,000 years ago – long before they became physically separated by water. The cause is unclear, but one reason may be the early flooding of the Carpentaria basin, which left Australia connected to New Guinea by a strip of land that may have been unfavourable for human habitation. Once in Australia, the ancestors of today’s Aboriginal communities remained almost completely isolated from the rest of the world’s population until just a few thousand years ago, when they came into contact with some Asian populations, followed by European travellers in the 18th Century. 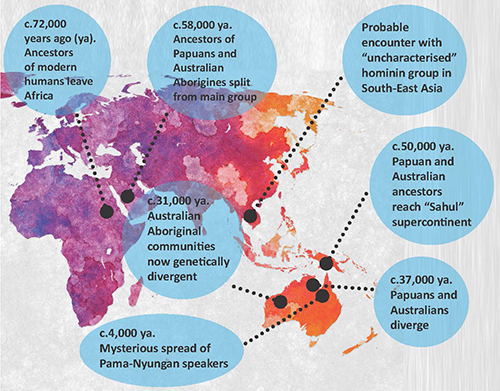 Indeed, by 31,000 years ago, most Aboriginal communities were genetically isolated from each other. This divergence was most likely caused by environmental barriers; in particular the evolution of an almost impassable central desert as the Australian continent dried out. Two other major findings also emerged. First, the researchers were able to reappraise traces of DNA which come from an ancient, extinct human species and are found in Aboriginal Australians. These have traditionally been attributed to encounters with Denisovans – a group known from DNA samples found in Siberia. In fact, the new study suggests that they were from a different, as-yet uncharacterised, species. “We don’t know who these people were, but they were a distant relative of Denisovans, and the Papuan/Australian ancestors probably encountered them close to Sahul,” Willerslev said. Finally, the research also offers an intriguing new perspective on how Aboriginal culture itself developed, raising the possibility of a mysterious, internal migration 4,000 years ago. About 90% of Aboriginal communities today speak languages belonging to the “Pama-Nyungan” linguistic family. The study finds that all of these people are descendants of the founding population which diverged from the Papuans 37,000 years ago, then diverged further into genetically isolated communities. This, however, throws up a long-established paradox. Language experts are adamant that Pama-Nyungan languages are much younger, dating back 4,000 years, and coinciding with the appearance of new stone technologies in the archaeological record. Scientists have long puzzled over how – if these communities were completely isolated from each other and the rest of the world – they ended up sharing a language family that is much younger? The traditional answer has been that there was a second migration into Australia 4,000 years ago, by people speaking this language. But the new research finds no evidence of this. Instead, the team uncovered signs of a tiny gene flow, indicating a small population movement from north-east Australia across the continent, potentially at the time the Pama-Nyungan language and new stone tool technologies appeared. These intrepid travellers, who must have braved forbidding environmental barriers, were small in number, but had a significant, sweeping impact on the continent’s culture. Mysteriously, however, the genetic evidence for them then disappears. In short, their influential language and culture survived – but they, as a distinctive group, did not. The paper, A Genomic History of Aboriginal Australia, is published in Nature. doi:10.1038/nature18299. 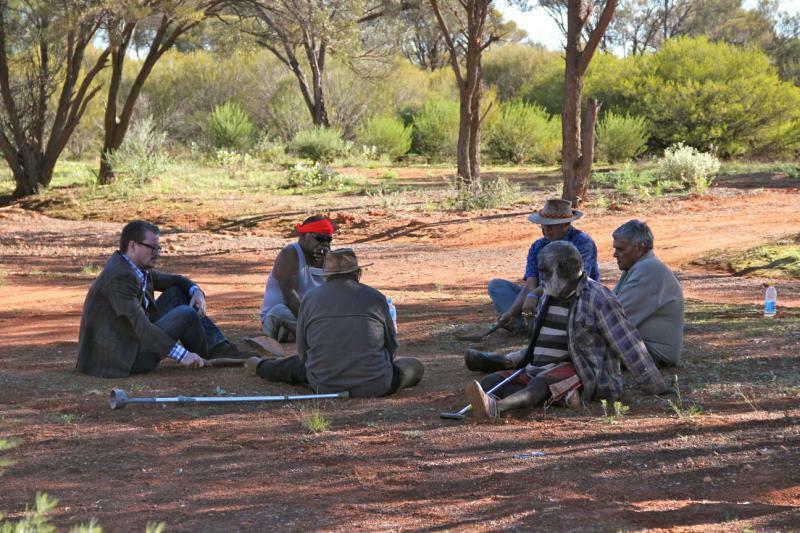 Inset images: Professor Eske Willerslev talking to Aboriginal elders in the Kalgoorlie area in southwestern Australia in 2012. (Photo credit: Preben Hjort, Mayday Film). / Map showing main findings from the paper. Credit: St John's College, Cambridge. Aubrey Lynch, elder from the Wongatha Aboriginal language group, who participated in the study.